SUPER NODE BREAKER IS NOW RELEASED! The block-breaker throwback with a spin! Featuring multiple game modes that use this classic mechanic and improve the gameplay surrounding it; multiple heroes to unlock and upgrade; improve their special powers and alter fate by changing drop probabilities! Keep the ball bouncing! 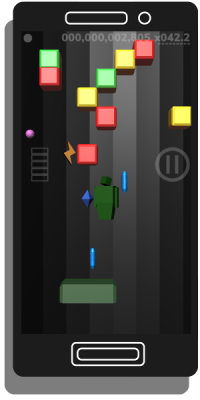 Destroy all the colored blocks to advance through progressively more difficult waves, how far can you get? How high a score? Collect Creds to upgrade your hero’s abilities, drop rates, and keys to unlock THE CUBE! A hollow cube of blocks that you must destroy to grab the treasures within! You control the cubes orientation with the flick of a finger! How fast can you clear THE CUBE? A quick clear could earn additional loot! Gamitus Labs, Inc. is a fledgling indie game development company with aspirations toward grandeur! Currently a solo operation with an outlook toward future growth.